This is the third blog in a series of blogs relating to turf care professionals. Why on earth would a pro-turf care series of blogs feature artificial pitch care? I know there will be some people who might ask such a question. Artificial grass isn’t grass at all – it’s plastic, right? It’s that astro-turf fake stuff, isn’t it? Well, yes, some people will regard 3G pitches as not ‘real’ pitches, and view them distastefully as plastic and fake. I may even stand with at least one foot in this camp. I love cared for real grass. But, I’m also interested in challenging myself and my perceptions of turf care. I’m interested in learning from people, making the most of opportunities, and meeting likeminded turf care enthusiasts. When my longstanding Twitter friend @theprisonlawyer suggested I chat to William Watson (@WWatson79), the Head Groundsman at Hamilton Academical Football Club, I jumped at the opportunity. @theprisonlawyer loves his football (Dundee United Football Club). He also knows me, he knows about my passion for lawn care and learning, and he knows the type of person I’d be interested in talking with. William kindly agreed to meet me at Hamilton Academical FC’s stadium. I had never been before, even though it’s only a few miles away from my home in East Kilbride, although I was aware the Club had a great reputation for its links with families, young people, and the wider local community in Hamilton and South Lanarkshire. I met William in reception and he led me through some corridors and out onto the pitch through the players’ tunnel. The first thing that struck me was how immaculately clean the pitch looked. It was stunning. Of course it wasn’t real grass, but my eyes were not convinced. My brain was telling me this was an immaculately groomed real grass football pitch. I kneeled down to touch the grass blades and my hands confirmed this was not real grass. An even closer inspection revealed the tiny black synthetic particles between the artificial grass fibres. William explained that these rubber particles help the 3G grass fibres stand up straight, improve cushioning, and extend the life of the pitch. I talked to William about my passion for lawn care. I wanted to highlight the passion grounds staff have in taking care of their playing surfaces. Obviously this wasn’t real grass, but I was really interested in learning about what it takes to care for an artificial grass pitch. William started by saying he also loves real grass. He was a groundsman at the stadium when the Club had a real grass pitch. The Club’s decision to switch to a 3G, 3rd Generation, artificial pitch was not taken lightly. The decision involved taking into account lots of factors. One of these factors was the Club’s commitment to nurturing new talent and its commitment to the local community. William said we play a lot of football on our pitch. There are kids playing on our pitch as part of the Club’s coaching and development programme. There is also the youth team and the first team who train and play on the pitch almost everyday. Certain ares of a grass pitch would find this amount of use difficult to cope with. William used the goal mouth area of a professional football pitch as an example of turf that suffers a great deal from wear. It takes a while to recover, and sometimes it doesn’t get a chance to recover before the next match is played on it. This is even more of a problem when youth and community football matches and training occur on the pitch when professional matches are not being played. William and I could both recall scenes of wet and muddy areas of pitches where no grass grew at all and the ball simply stopped rolling every time the ball was played across these areas. Of course William would prefer real grass, but the practicalities of the 3G pitch suits the Club and the community. William explained that if a football pitch, real grass or 3G, fails a pitch inspection the match is called off and the professional football club can be fined. This is not something any grounds staff, or football club, wish to be confronted with. We walked across the width of the pitch to take a look at the machinery William uses to care for the 3G playing surface. Earlier that day I had been cutting lawns on my regular lawn run and I was really surprised to find that the feeling of walking on real grass was strikingly similar to walking on this pitch. It had the same comforting feeling beneath my boots. It was absolutely nothing like the old artificial astro-turf surfaces I remember playing football on many years ago. The artificial pitches I played on when I played football in the military back in the early 1990s must have been 1st generation. They had the feel of running on top of a very thin carpet laid on top of concrete. This 3G pitch was actually very comfortable – it felt like real grass. William said this pitch was laid by a professional company specialising in this type of playing surface. Below the grass there is a layer of shock absorbing material. The pitch is regularly inspected by independent football officials to ensure the pitch meets the required standards for professional league football. These inspections include subjecting a match ball to bounce and roll tests to ensure the pitch is within given tolerances. The pitch cannot be too hard or too soft. William explained that the Club’s pitch is the highest standard and grade that is possible with a 3G playing surface. It exceeds the requirements necessary for professional football, and is a grade suitable for professional rugby. As you can imagine, an artificial grass surface used for professional rugby matches needs to pass tests relating to its ability to absorb a great deal of shock in order to prevent injury to the players. From what William told me it was clear that he, the Club, the players, and the fans are all proud that their 3G pitch is ‘the best there is’. So, how are the best 3G pitches cared for? William showed me the range of brushes and tines he uses to care for the pitch. These brushes are attached to a very small tractor unit and are driven across the surface of the pitch. Some of the attachments resembled large sweeping brushes. Another resembled an old worn out frazzled toothbrush. William laughed and said that particular brush is used to get between the fibres of the pitch and help them separate and stand up straight. It was meant to look the way it did. Another brush was made of metal tines. William says that one is used to aerate the pitch. Not in the way a grass pitch is aerated by having the tines forced through the surface. This type of aeration is similar to the toothbrush attachment I’d chuckled at earlier. It teases the blades apart. It is also used to take ice off the surface in winter. This must be done very gently. The tines break up the ice so it can be brushed off the surface. There is no underground heating below the surface of this pitch. When we see a match being played in the middle of winter, when many other professional football matches may have been called off, it’s down to William’s patience, hard work and determination to ensure the match goes ahead. William said in winter he has been known to start preparing the pitch at 4am so it is ready for an afternoon kick-off. William also tells me there are areas of the pitch that need a little more maintenance than others. Much the same as a real grass pitch there will be high travel areas around the goal mouth. This can flatten and compact the 3G playing surface. William knows the pitch well, and he knows what to look for. He says he gets a great view from the floodlights above the stadium. I thought he was joking, but sure enough, William has climbed up the ladders inside the floodlights and has taken photographs of the pitch. The photographs can highlight shadows on the pitch where he may need to concentrate his maintenance efforts, such as replenishing the small rubber cushioning particles. William says he’s even asked contractors working on the stadium to take photographs of the pitch when they are working at height around the stadium. In summer you may also see William watering the pitch before a match starts and during the half-time interval. The reason for this is to cool the surface of the pitch. This makes playing on the surface a little more pleasant in high temperatures. William is sure there are a few people who wonder why he is running onto the 3G artificial pitch at half-time with a hose and sprinkler. It’s not real grass, but it does need watered now and then. Before finishing my visit William took me around the side of the pitch to show me a garden and play area the Club have opened for the community. Local artists had also drawn colourful murals depicting people, places and characters associated with the club. It gave me a real feeling of community spirit. I felt proud of this Club that I had never visited before. I decided I would return with my family to visit the community garden and play area, and perhaps even take my two children to watch their first professional football match. As I was leaving the stadium we met one of the first team football players. I was delighted he was happy to chat to me about playing professional football on the pitch. He was honest and said he too loved real grass. But, he said, there are times when some real grass pitches end up like a ploughed muddy field as a result of prolonged bad weather. He said he would much rather play on their 3G pitch than a poorly cared for grass pitch any day. That was a perfect explanation. Without doubt I could see that William was able to transfer his passion and pride for caring for real grass pitches to that of the 3G pitch. There was a pattern developing in my discussions with grounds staff. Pro-turf care is about ‘care’. It’s also about pride, passion, enthusiasm, skill, knowledge, experience, and going the extra mile. William has all of these qualities in abundance. I learned a lot from him. I will put what I learned from William, and the other turf care professionals I have met, into practice in my own lawn care business. Thank you, William. Your passion, pride and enthusiasm is infectious. 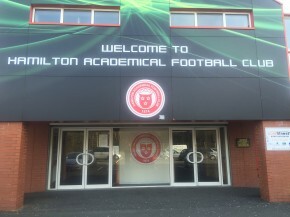 I shall visit Hamilton Academical Football Club again.